A song to play while reading about the Mets: “Secret Garden,” by Bruce Springsteen – It’s cliche for a baseball writer to go back to the Springsteen well, but hey, if you change all the references to the woman in “Secret Garden,” it could very easily be a song about being a long suffering Mets fan. Back in the days before regional sports networks, when a pair of rabbit ears on an enormous, cabinet-size Sears television could pull the games of three Major League teams out of the air and into our New Jersey home, it was the Mets who loomed the largest during my early-80s childhood. Every night, the Mets were on WOR. Every night, my dad and I would watch them on that Sears TV, old enough to understand that winning was good, young enough to not understand the more intricate nuances of the game. Such is childhood. Winning the World Series in 1986 spoiled things a bit. Why can’t they do that every year? At that age, there’s a lot you don’t understand and never could. A few years later, most of the Mets telecasts would move to SportsChannel. The Yankees were already on MSG. A few games were still broadcast over the air locally, but we didn’t have cable in our house, and that left precious few baseball games on that Sears television, and when the Mets were on, they weren’t winning. You have to pay your dues as a Mets fan. You have to suffer through 90-loss season after 90-loss season only to have a bright six- or seven-year stretch that drives fans to despair when Carlos Beltran strikes out in Game 7 with the bases loaded, and then the cycle repeats. It’s been two years since the Mets stumbled their way into a World Series appearance, propelled to October by the deadline acquisition of Yoenis Cespedes. Now, Cespedes’ former agent Brodie Van Wagenen is the Mets’ new general manager, and while he may not be the man who is truly in charge (Jeff Wilpon, we’re looking at you), there’s at least hope that his history as an agent will help the Mets keep Jacob deGrom as well as build a better analytics department that will lead to better drafts and better free agent signings. It’s been a long time since Jesse Orosco knelt in the Shea Stadium grass and punched his fists into the night sky. Now in my late 30s and a father, I don’t need to adjust the rabbit ears on the television, but the combined static of time and often-repeated futility blurs the memories of the Mets of the 80s. Maybe a World Series win in high definition won’t fade with time. What is the Mets’ most recent accomplishment? The three-headed monster is dead. The troika of John Ricco, J.P. Ricciardi and Omar Minaya, who inhabited the general manager’s office at CitiField following Sandy Alderson’s July departure due to cancer, have been replaced with former player agent Brodie Van Wagenen. Van Wagenen, who previously represented 2018 NL Cy Young winner Jacob deGrom, Yoenis Cespedes, Tim Tebow, and the Mets’ biggest offseason pickup, Robinson Cano, will be charged with building a winner and an analytics department nearly immediately. With the addition of Cano and Edwin Diaz via trade and the free agent signings of Jeurys Familia, Wilson Ramos and Jed Lowrie, he’s off to a decent start. 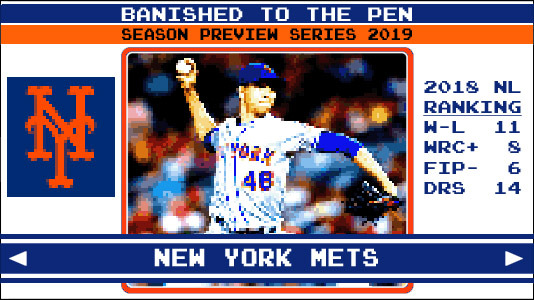 How do the Mets define success in 2019? An above-.500 finish in a highly competitive NL East is a good season for the Mets, who are behind the Phillies, Nationals and Braves in terms of both talent and organizational depth. A playoff appearance would be gravy. While the Mets have two of the game’s best starters, they also plated three or fewer runs in 81 games last year. They won a scant 17 of those contests, and so they’ll need better offense to find success this season. You know his flowing blonde locks, but if you don’t follow Noah Syndergaard on twitter, you’re missing out on the Mets ace’s hilarious Extremely Online personality. He’s reacted to the news that JA Happ, recently acquired by the Yankees, was suffering from hand-foot-and-mouth disease, weighed in on the universal DH (“Not on my watch! Bring me my hammer!”), and humorously tweaked current and former beat reporters. It was a big year, 1969, what with the moon landing and the miracle Mets. On July 27, when the Mets play Pittsburgh at 7:10 p.m., the first 25,000 fans will receive a Mr. Met on the Moon bobblehead, tying the 50th anniversary of the Mets’ first good season and a historical date together.